Greater Manchester is aiming to be “the best place to live with dementia in the world” and Health Innovation Manchester is committed to supporting work towards this vision. It is estimated that there are currently over 30,000 people living with dementia in Greater Manchester with the city region spending £270million a year treating and caring for people with dementia. With an ageing population and rising numbers of people being diagnosed with dementia, it is one of the greatest health challenges facing the country and Greater Manchester. In parallel we are also working with Dementia United (DU) and the established research community to support a more coherent strategy for dementia research/trials. The vision is to improve outcomes in dementia by ensuring optimal access and uptake of innovative technologies and treatments for eligible patients as well as ensuring the health and care system is geared to provide the best support for people living with dementia by establishing an early detection and diagnostic framework for Greater Manchester. Sue Clarke, Operations Manager Greater Manchester at Alzheimer’s Society, believes dementia “cuts across society” and it is vital that organisations work together to deliver transformations in outcomes and help people to live well with dementia. Sue, who is co-chair of the public involvement and engagement workstream of the Dementia Early Detection & Diagnostic Framework, believes Greater Manchester is well placed to make a difference in dementia awareness, support and research, working towards a goal of making it “the best place to live with dementia in the world”. “Dementia is cross-cutting; it is not just about health and social care – it involves everyone in the community,” she said. “Industry, retail, businesses, local authorities, research, leisure services and charities all have a role to play in supporting people to live with dementia. 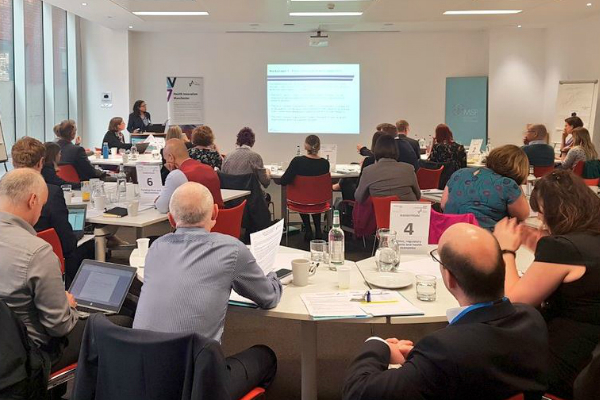 “It is fantastic that Health Innovation Manchester have managed to cut across traditional boundaries to bring so many organisations together for the framework. Dementia is one of the greatest health challenges facing the country and Greater Manchester at the moment. In Greater Manchester alone, it’s estimated there are currently over 30,000 people living with dementia and numbers are predicted to rise over the next 20 years. She added that a vital part of the framework will be awareness raising of dementia. “People with dementia are at greater risk of social isolation and loneliness and part of our Dementia Friendly Communities work focuses on everyone in the community sharing responsibility for ensuring people with dementia feel understood, valued and able to contribute to their community,” she said. “Health Innovation Manchester have been amazing at understanding this and bringing together organisations and innovative ideas which will make a difference.